Rotherham United boss Paul Warne may actually be able to make a few changes against Bolton Wanderers...at last! Rotherham boss Paul Warne is looking forward to the luxury of being able to fill his substitute's bench for the game with Bolton. The Millers were hit with an injury crisis before the international break, which robbed them of eight players at its worst, and Warne was not able to name a full matchday squad in his side's last three games. But the two-week hiatus has helped as all but long-term absentees Sean Raggett and Darren Potter are back in contention when Wanderers visit the AESSEAL New York Stadium. That means Richie Towell, Jamie Proctor, Richard Wood and Clark Robertson are back and having options on the bench leaves Warne in an unfamiliar position of strength. “I have got options, so I can possibly make changes,” Warne said. “Also having all my best players back means having a strong bench gives me the opportunity to make subs if someone does not perform or does not do something you want. 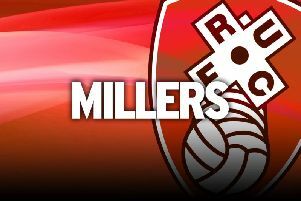 The Millers are without a win in five games and will be hoping to put that right against a Bolton side who traditionally struggle in Rotherham. Wanderers, who last won in this part of South Yorkshire 52 years ago, had a good start to the campaign but have won just one of their last eight matches. Warne still fancies them for a mid-table finish, though, and claims they are a “better version” of his side. “Bolton had a really good start to the season, they are a better version of us possibly,” he suggested. “The quality of player they brought in during the summer was really good, I really like the lad (Josh) Magennis. (Yanic) Wildschut I like him, I could go through their attacking players. “Overall going forward they are a real threat. “They are a better team than people give them credit for, they make it hard, they don't concede many goals. “They will be looking for a mid-table finish and after the start they have had I think they will get that.